Greddy and Garage Saurus have been working together on upgrades for the R35 GT-R. 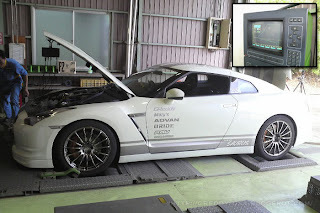 Previously they reached 655 hp. 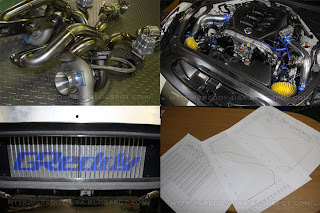 With a set of TD06-20g turbos strapped to the side of the VR38DETT, new connecting rods, and 830cc injectors, the R35 laid it down with 834 ps. (Pferdestärke , or metric horsepower) or 822 hp. The initial test at 1.4kg/cm of boost made over 750ps!! On the second run the boost was turned up to 1.55kg/cm2. This maxed out the injectors to 99% for a 834ps pull!!! This is not the end of the story, as they will be looking to make even more power.